Scroll down to watch the step-by-step demonstration in the video. Did you know that you can use spaghetti squash as the base for a salad? But thanks to my dear friend (and amazing photographer) Helene, I now know something new. Not only is spaghetti squash delicious as a substitute for pasta in warm dishes but its also delicious served chilled in a salad, just like this one. The secret to making a meal like this very quickly, is to do just a little pre-prepping so you have some head-start ingredients in your fridge come meal time. Ideally you would roast your spaghetti squash in the oven, but if you forget, you can always throw your squash in the microwave for a quick cooking option. This salad is beautiful on its own as a light meal or you can certainly serve it alongside some grilled chicken or fish for a heartier meal that would also add some protein. Have you ever used spaghetti squash in a salad before? If so, what’s your favorite combination? If you want to make this salad vegan, simply omit the feta cheese and sub in some kalamata olives. 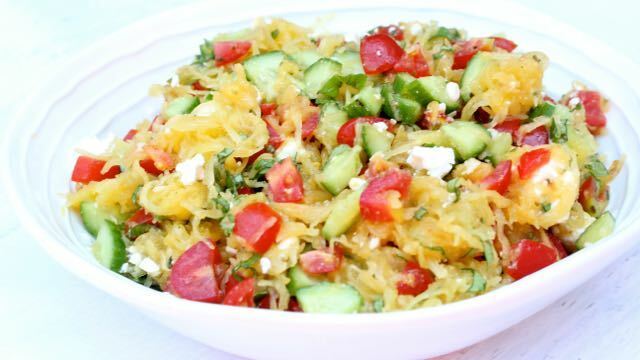 In a large bowl combine spaghetti squash, cucumbers, tomatoes, feta cheese, and fresh basil. In a small separate bowl or spouted cup, combine extra virgin olive oil, lemon juice, garlic, oregano, salt, and pepper. Whisk together and then drizzle the dressing over the veggies. Gently toss everything together and serve. Enjoy! To learn more about spaghetti squash check out this 101 video. I am not a fan of cucumbers so is there something else that might work in the Greek Style spaghetti squash salad? I think about adding some green or black olives but what other veggies might work? It looks delicious but I just can’t get past the cucumbers. Hi Laurie! Sure, kalamata olives would be great! You can try subbing zucchini for the cucumbers, and beets would work well in this, too! Very good without cucumber. I neither had nor missed them. Good to know! Thanks for sharing Keren.